Sign up for the Chopta trek and spend 4 days with gorgeous views of snow-clad Himalayan peaks. You'll trek to Tungnath, the highest temple of Lord Shiva at 12,073 feet. You'll climb to the summit of Mt. Chandrashila, a high-rising mountain peak with panoramic views. You'll hike up to visit the Deoriatal Lake, located to the backdrop of heavily wooded, snow-covered mountains of Chaukhamba. Throughout your trek, you'll stay in Swiss tents that come with attached washrooms and comfortable beds. Combining adventure with comfort, the Chopta trek is perfect for first-time and amateur trekkers. Please note that a minimum of two travellers are required to book the Chopta trek. Chopta, often called as the 'Switzerland of India', is perched atop gorgeous Himalayan mountains at an altitude of over 7,700 feet. Placed close to popular, nature-rich destinations like Deoriatal and Chandrashila, the village attracts thousands of trekkers every year. While the rolling green mountains spring with colourful, alpine flowers and bushes in the summer, the landscape is painted with pristine white snow in the months of winter. 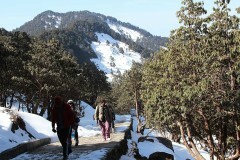 • Trek to Tungnath, the highest temple of Lord Shiva. • Climb up to an altitude of 13,000 feet to summit Chandrashila. • Get astounding views of snow-clad Himalayan peaks. • Sleep in comfortable Swiss tents with attached washrooms and beds. Travellers are required to follow instructions of the trek leader during the Chopta trek. Consumption of alcohol, drugs and tobacco products like cigarettes is strictly prohibited during the Chopta trek. Cancellations made 4 weeks prior to departure date of the Chopta trek: 65% refund. Cancellations made 3 weeks prior to departure date of the Chopta trek: 40% refund. Cancellations made 2 weeks prior to departure date of the Chopta trek: no refund. All refunds processed after deducting a transaction fee of INR 200 per person. This fee is charged by The Great Next. Travel arrangements between Dehradun or Haridwar or Rishikesh can be arranged at an additional cost of INR 13,000 per vehicle for a Suzuki Dzire vehicle and INR 18,000 per vehicle for a Toyota Innova vehicle. The tour operator reserves the right to cancel or change the itinerary of the Chopta trek due to unforeseen circumstances such as bad weather or natural calamities. Travellers will be required to bear the cost of such changes to the itinerary. There is no pick-up point for this Chopta trek. There is no drop-off point for this Chopta trek. 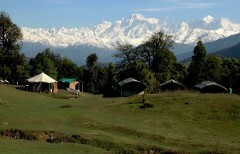 Arrive at your serene campsite in Chopta by afternoon and check-in to your Swiss tents. After a refreshing welcome drink, you can settle in and enjoy beautiful views of the surrounding mountains and forests. Participate in few outdoor games with your group or head out for an acclimatization jungle walk. Overnight in Swiss tents at the Chopta campsite. Wake up to the sound of chirping birds and the aroma of hot tea. Today, you'll drive a short distance from the campsite and begin the trek to Tungnath, the highest temple of Lord Shiva in the world. The trail leads you through lush green meadows with beautiful views of the entire snow-clad Himalayas. After visiting the Tungnath temple, you'll continue further to reach the Chandrashila summit, where you'll enjoy beautiful 180-degree views of the surrounding valley. Return back to the Chopta campsite over the same trail by early evening. Overnight in Swiss tents at the Chopta campsite. Early in the morning, you'll drive a short distance from the campsite to Sari and begin the trek to Deoriatal. The journey will take you through thick forests of rhododendron, ferns and other alpine wild flowers. At the lake, you'll be greeted with views of the Chaukhamba peaks reflected in clear waters of the lake. Overnight in Swiss tents or cottages at the Deoriatal campsite. On the last day of your adventure, you'll check-out of the Deoriatal campsite, spend the morning on the banks of the lake and trek downhill to the village of Sari. Your trip ends here. Personal expenses such as extra meals or beverages, apparel or gear etc. Overnight in Swiss tents at Chopta. Check-in to your Swiss tents at the Chopta campsite. 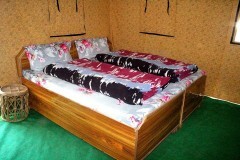 The tents come equipped with attached washrooms, comfortable beds with clean sheets and blankets. Today's meal package includes dinner only. You'll also be served a refreshing welcome drink on arrival. Trek from Chopta to Tungnath and Chandrashila. 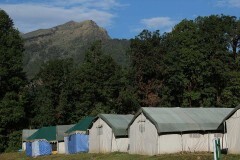 You'll be accommodated in the same Swiss tents at Chopta. Today's meal package includes breakfast, lunch and dinner. Tea and coffee will be available in the morning and evening as well. Overnight in Swiss tents or cottages at Deoriatal. Drive from Chopta to Sari and trek from Sari to Deoriatal. You'll be accommodated in the Swiss tents or wooden cottages at Deoriatal. Today's meal package includes breakfast, lunch and dinner. All meals will be vegetarian. Trek from Deoriatal to Sari. At an additional cost, round-trip transport can be arranged from Haridwar, Rishikesh or Dehradun. Today's meal package includes breakfast only. The campsite is located 7-hr drive away from Dehradun's Jolly Grant Airport. You can board a flight to the airport and hire a private cab or taxi to reach the campsite.